Earners have demonstrated an understanding of the connectedness between their identity, values, experiences and goals. They are able to set goals & measure success. They have demonstrated resiliency & adaptability to handle road blocks in attaining objectives. They understand the value of intercultural humility and have demonstrated the ability to incorporate other perspectives. Earners have demonstrated critical thinking skills and can apply those skills to impact various forms of engagement. 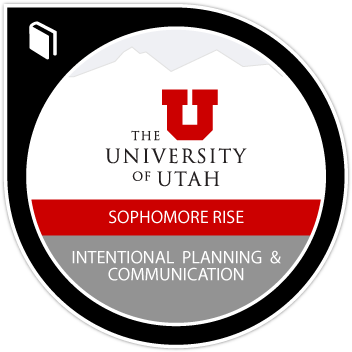 Goal Setting Project - Plan to Finish - badge earners have completed a Plan to Finish at the U that includes academic, community, self, and campus life goals. Earners have developed and presented an action plan for making the Plan to Finish a reality. Critical Thinking Project- Life Map: The Journey of You- Badge earners have created a life journey map that shows how they arrived at the point they are now. The project also includes crafting a map of where they are headed next. They have incorporated analysis about how their life experiences can be applied to their future engagement in education, community, and life. Intercultural Humility Project – Social Identity Profile -Badge earners have presented and discussed their Social Identity Profile which is a way to analyze the identities they claim and those that are ascribed to them. They have also identified how they ascribe identities to others. The Intercultural Humility Project develops empathy for and an understanding of the experiences of others.